A privately funded monument in Madison’s West Cemetery honors veterans of the Civil War as well as the nation’s earlier conflicts. 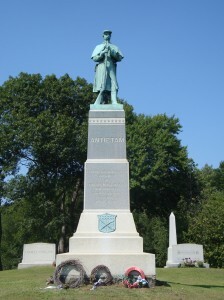 The 1896 monument, featuring a bronze infantry soldier atop a granite base, was sponsored by Vincent Meigs Wilcox, a Madison native who served as a colonel in the 132nd Pennsylvania volunteer infantry regiment. 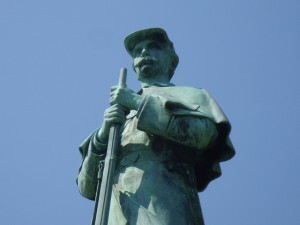 The south face also includes a bronze shield with crossed rifles symbolizing infantry units, and the battle of Antietam is inscribed on the monument’s shaft. 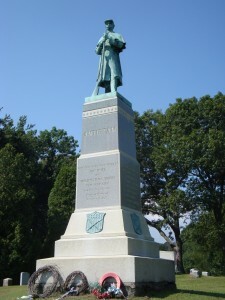 The monument, sculpted by Henrich Manger, was sponsored by Meigs after a dispute among Madison’s citizens about the proper way to honor its Civil War veterans. 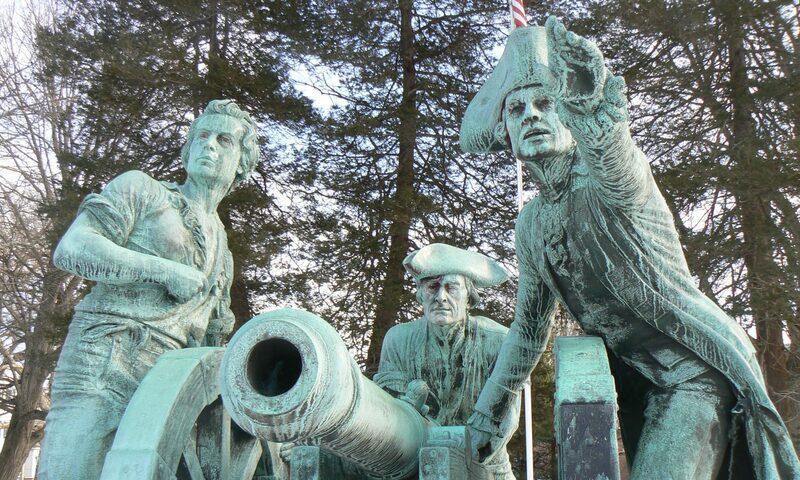 Like several towns in Connecticut, Madison decided a memorial hall was a more practical tribute than a monument, so Meigs, who had advocated the construction of a monument, decided to build one. Meigs, grew up in Madison and served in the Connecticut militia in 1856 before moving to Scranton, Penn. 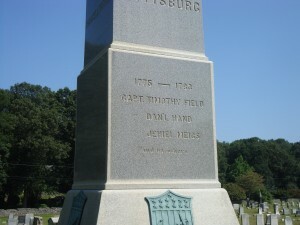 He joined the 132nd infantry regiment as a lieutenant colonel, and assumed command of the unit during the Battle of Antietam when the unit’s colonel was killed. During its nine months of service, the regiment also fought in the Second Battle of Bull Run, as well as the battles of South Mountain, Antietam, Fredericksburg and Chancellorsville. After the war, Meigs was an executive in two New York photography businesses. 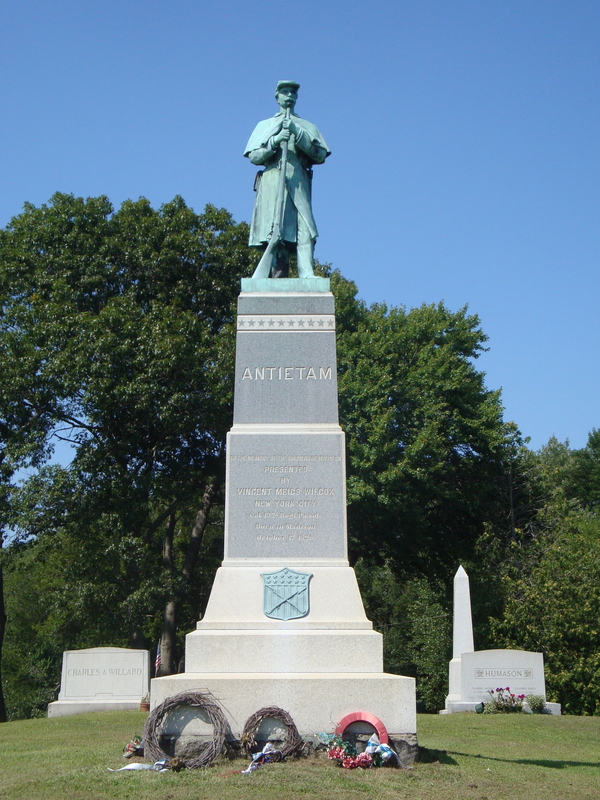 Unfortunately, he died a few months before the monument’s dedication on July 4, 1896.